Home cherry mobile specs CM Flare 2.0 Specs, Price, Available Now! CM Flare 2.0 Specs, Price, Available Now! A quadcore mobile phone from Cherry Mobile, which means two times the speed of the previous CM flare. Recently got leaked from A Thailand Page of Cherry Mobile, and hopefully It will be released soon in the Philippines. Since we all know how the Original CM flare performs its best, how more for this one, and not only its a Quadcore, but also RAM has been increased to 1GB, that's a lot of RAM to play HD games. The only downside here is that the battery of CM Flare 2.0 is still the same (1500mAh) and the hours of usage will totally be lessen, and we will be carrying our charger very often. Long story short, lets share the news! As you can see in the specs, there are not much different than Original CM Flare, so maybe I can estimate the price range from 4,500php to 5,000php. And as soon as I get my hands on the tut on how to root Cherry Mobile Flare 2.0, I will definitely make a post for that. Be sure to subscribe to our daily updates. 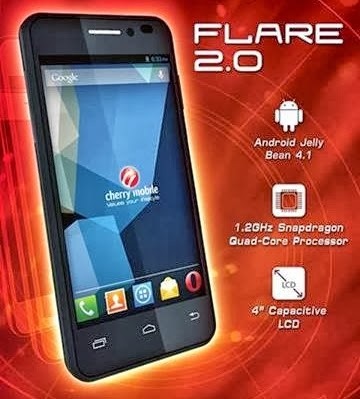 How Much is Cherry Mobile Flare 2.0? As of now, we don't have a clue of how much is Cherry Mobile Flare 2.0, price estimation will range from Php4,500 to Php5,000. When will be Cherry Mobile Flare 2.0 Available in The Philippines? Soon enough, as of now Cherry Mobile is currently looking in the market trends, competition, and lots of factors in business, that is just my opinion. Update: CM Flare 2.0 is priced at Php3,999 | Available this September 21 at SM North EDSA. Nagbebnta din ba cla nang battery? nice smart phone . . . when it available?? battery standby of flare 2.0? how many hours?? I can't say that this is accurate, but based on its specs maybe less than a few hours from the original CM Flare. COMPARE IN LG L3 DUAL AND FLARE 2.0 WHAT IS THE BEST RECOMMENDED?? Its August now, still CM hasn't announced the date of release. CM flare 2.0 is not yet official, maybe CM will a surprise under its sleeves. Marame na naloko ng cherry mobile flare na yan, sa una akala ko ok yung unit walang problema kahit na marame na akong nababasang blog na hindi maganda ang cm flare,pinagmamalaki ko pa na nasa paggamit lang yan kahit 5 times ako mag recharge ng battery inisip ko baka natural lang yun, pero naka off na lahat wifi, brightness, gps etc..ganun pa din 5 times pa rin ako mag recharge, on the 2nd week na eto na laging naghahang so kailangan ko tanggalin ang battery para mag on ulit, di ko na nga halos magamit yung flare super bilis malow bat...kunting pagfefacebook lang nalolobat na agad di ko nga magamit pantawag e...ayun hangang sa iniiwan ko na lang sa bahay di ko na magamit sa ofc...so pinagtiyagaan ko na ganun palage naghahang..umabot ng 6 months pa lang sa akin cm flare ko na hindi halos nagagamit hanggang sa nag black out na tuluyan logo na lang ang lumalabas , dinala ko sa service center sa orient pearl mabini ireformat lang daw after 3days balikan ko daw , pagbalik ko di pa dw nagagawa kelangan na dw palitan ang mother board, ganun na agad kalala?! lahat ng andun sa service center na nakapila halos cm flare ang pinapagawa, napagalaman ko na alam nila ng Cherry mobile company na yan na 6 months to 1 yr lang ang itatagal ng mother board ng cm flare na yan at sa iba pa nilang product, grabe! kaya kayo dyan na inaakala nyong ok ang nabili nyong cm flare nag kakamali kayo akala nyo lang yan dahil sa dami na ng nakabili ng cm flare ganyan din ang naexperience nila...KAYA WAG KAYO BIBILI NG KAHIT ANUNG CHERRY MOBILE PRODUCTS SOBRANG MASASAYANG LANG ANG PERA NYO. WAG KAYO PALOKO SA CHERRY MOBILE! Sayang..nag babalak na ako bumili ng flare 2.0 ..
pangit ba talaga CM FLARE ? sana meron na nyan this september sa pinas..i'm waiting to buy..
buti nalang nagbasa muna ako ng mga comments dito bago magdesisyon... hahahahha. salamat sa mga nag share ng opinyon..
bat ganun yung mga comment? totoo bayon or another company na naninira lang?